Sorry to switch the topic, but this evening I spent a delightful forty minutes with a friend, lost in conversation while walking through the rain in Paris. If you’re going to walk through the rain anywhere, I highly recommend Paris. Going back to the question of four dimensions… If you were a two dimensional being in Flatland, and you really wanted to understand 3D, you would want the most high quality visualization you could get of that mysterious higher dimensional world. In that spirit, it seems to me that it would make sense to create the most vivid possible representation of our four dimensional object — even if it is impossible for such an object to exist in our world. However we choose to simulate this four dimensional object, our simulation should appear before us with the same sense of “presence” as a real object. And if we reach out our hand, we should be able to touch it. Sounds like a great opportunity to build a really good virtual reality experience. 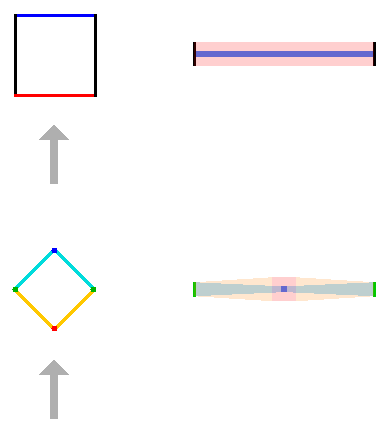 I find this technique for visualizing higher dimensions — referred to as “Ariel’s design” in the story — to be very useful for my own understanding of 4D shapes. I am now much better able to, say, think about the parts of yesterday’s shape. 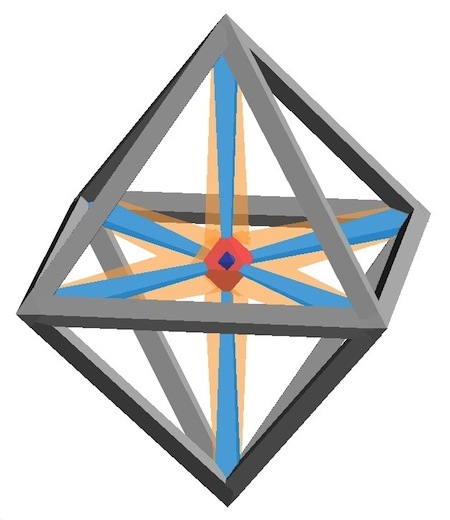 By the way, that shape is actually called a 16-cell, because it has sixteen three dimensional “sides”. 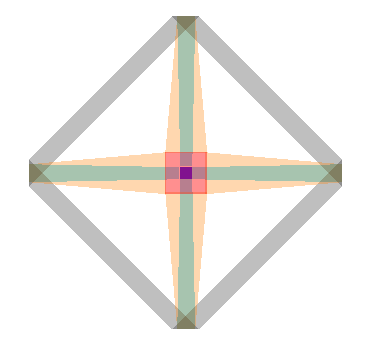 It’s also sometimes called a hexadecachoron, which is just a fancy Greek way of saying “sixteen sided space”. Using this approach, I can now understand the more complicated 24-cell much better than I could ten days ago (when I first wrote about it here). Still, Trey’s question haunts me. To put the question simply: It is clear that a two dimensional square contains area. And it is clear that a three dimensional cube contains volume. 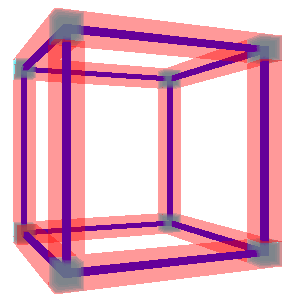 But what sort of stuff does a four dimensional hypercube contain? What does it feel like to be ‘inside’ a hypercube? Is this something our poor human brains could ever get a feel for? “No biggie — we just call that a picture. Those flat things that you call pictures are so lame. Trey thinks it’s a bit unfair that he can’t see his new acquaintance. “Where are you?” he asks. Trey is feeling very good about having introduced Ariel to the wonders of three dimensions. He is especially pleased to see her grasp this idea that things in his world can have shapes like squares and triangles around the outside. After all, Ariel couldn’t have any experience with a concept like ‘volume’ — something that people who live in a three dimensional world deal with every day. Just then he hears an unearthly voice. He can’t quite tell where it is coming from. The voice seems to be from everywhere and nowhere all at once. He looks around wildly, trying to figure out who is talking to him. Just then an indistinct form appears — something that is right in front of him, and yet somehow not quite there at all. Perhaps, he thinks, trying to stay calm, there are worlds beyond this. “That is very solid of you,” Ariel replies. “This represents what we call a cube,” he says. “It’s like a square, only deeper. 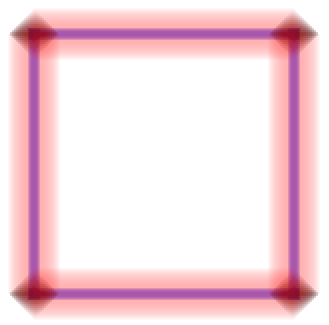 The fat red lines are edges that are `nearer’ in the third dimension, while the skinny blue lines are edges that are `farther'”. “What are the dark diamond shapes in the corners?” Ariel asks. Ariel felt quite pleased that she had been able to convey to Lennie the wonders of two dimensional shapes. And this got her thinking — maybe the same techniques could be applied to more dimensions. So Ariel took a plane to see her friend Trey, who lives in the third dimensions. She had read in school that there are all sorts of hypothetical shapes in a three dimensional world that cannot exist in the normal two dimensions that she’d lived in all her life. Maybe, she thought, the right visualization technique could help her understand these fabulous shapes. Trey was very happy to see her. They had first met in his younger days, when he had kept a flat just outside of Plano Texas. He still had fond memories of those times, which despite appearances went very deep. When Ariel posed the problem to him, Trey was intrigued. How could he combine her visualization techniques with his knowledge of the third dimension, to explain higher dimensional shapes to Ariel? Let’s say our two dimensional creature is named Ariel (which sounds like “area”) and our one dimensional being is named “Lenny” (which sounds like “length”). Let’s also assume that Lenny can detect color as well as something equivalent to what we might call “thickness” — which might appear to him as a more vivid color, or some sort of texture, or perhaps a greater visual density. When Ariel wants to show various shapes to Lenny, she can use both thickness and color to suggest a second dimension. For example, suppose Ariel wants to convey the idea of “a square” or “a diamond”. To us these are rotated versions of the same shape, but to Lenny, rotation is a very advanced concept indeed, so Ariel will present them as different shapes. Lenny can see only an “x” dimension, but Ariel asks him to imagine an extra “y” dimension. Ariel uses both “redder” and “thicker” to convey “nearer in y”, and “bluer” and “thinner” to convey “further away in y”. Of course to Lenny these are just abstractions — but Lenny understands them because he already has experience with “near” and “far” along his own x dimension. Lenny discovers that he can use his powers of imagination to understand these two shapes, which makes him feel rather clever. But then Ariel tells Lenny that the square and diamond are actually the same shape — each is just a rotated view of the other. You are currently browsing the Ken’s Blog blog archives for April, 2013.